So this idea is pretty straight forward, but results in a pretty classic and unique computer case. Use the body of an old red rotary phone to hold the needed PC components, including Zotac ION board, in a novel new case. Even better, use the body of a retro-styled-but-new rotary phone with push to dial buttons in each finger hole, allowing the phone to double as both a telephone and a PC. Now the phone-pc can sit on any desk and offer standard phone functions even to those who might miss its true nature. While a standard Bluray or DVD drive might fit into the bottom of the base, more advanced modding might be able to incorporate a pop-up CD door right under the circular number pad, much like the once popular discman portable CD players of the 90's. With some extreme modding, the dial buttons might still be left functioning even then! This case mod easily reflects all the key features of ION; it's small, it has an HDMI output to display high resolution graphics, and an old telephone certainly embodies the feeling of low power usage (the original phones didn't need to be plugged into anything at all but a phone jack!). 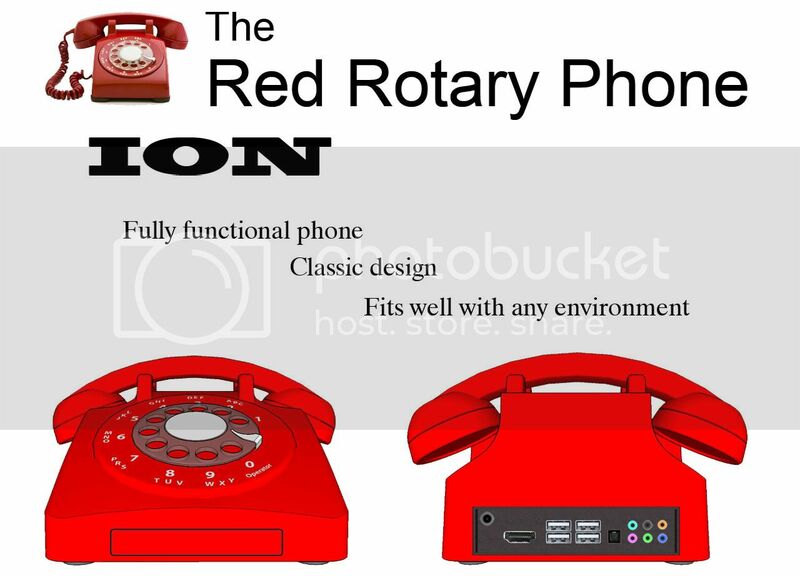 Most old red rotary phones should offer sufficient space for the needed components, although some smaller ones won't do. To achieve extra interior space, if so desired, a slight, hardly noticeable extension of the phones base could also be added fairly easily. The image has a visible DVD door on the front for reference, but in actually building it I would suggest trying to conceal it as much as possible.